Cemetery is always the ending of everyone. In whatever place and in whatever culture, cemeteries always give people a feeling of horror and sad. Located in Shatin, Hong Kong, Po Fook Hill is dedicated to break this destiny! Founders of Po Fook Hill believe, “Death” is an obvious ending of every human and therefore is not a taboo at all. They emphasize that “A beautiful life journey should include its beginning and its ending”. If you have ever been to Po Fook Hill, you will have such a feeling. Everywhere inside Po Fook Hill are Chinese pagodas and pavilion, surrounded by birds and flowers. Coupled with the goldfish pond, you can only feel the liveliness within, instead of gloomy feeling that can be found in most cemeteries. In fact, Po Fook Hill is so different from others. It hosts a beautiful website, constantly advertises on medias and sets up sales offices everywhere in Hong Kong. Although with Taoism background, it is willing to accompany with other religious background of their customers. This makes them well accepted by people and also grants lots of business for themselves. Apart from that, Po Fook Hill is so special because of one facility inside. It operates a private railway system for their customers, the “Po Fook Hill Cable Car”! Visiting cemetery during Ching Ming and Chung Yeung Festivals is a traditional Chinese custom. In order to assist their visitors climbing up to hill, Po Fook Hill built an escalator system along the slope. The escalator system allows large number of visitors climbing up the hill quickly. However, it cannot fulfill the needs of elders and wheelchair users. In order to solve this problem, Po Fook Hill also built a Cable Car system. As a cemetery, owning a private railway system itself is so unbelievable. This also makes rail enthusiasts fired up! “Po Fook Hill Cable Car” can be called as “unknown” to the general public. It is because not a single map of Hong Kong ever showed its existence. Also, no books featuring this system can be found. And even the website of Po Fook Hill did not mention that. So if you have never been to Po Fook Hill, you can never know such a system exists! Even only a few rail enthusiasts know about it. Because of that, let me introduce this hidden railway for you. Going to Po Fook Hill is simple. Just exit from Exit B of Shatin MTR Station. Head to the direction of Grand Central Plaza. Po Fook Hill is only in five minutes walking distance. 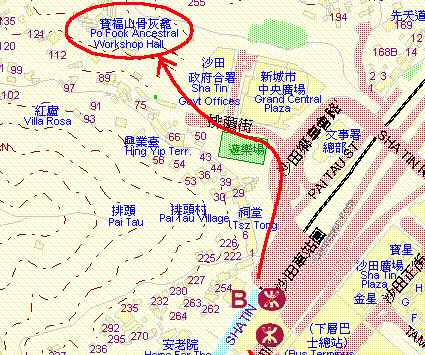 You cannot find “Po Fook Hill Cable Car” from any map. But you can see it clearly in satellite photos of Google Map. At the main entrance of Po Fook Hill, you may think it is a park, a tourist attraction, or a temple. But you can never imagine that here is a cemetery! After entering Po Fook Hill, follow the slope on your right. You can see this big sign hanged on the fences in front of the car park. The sign points to the cable car station. Follow the sign and continue walk up the slope. You can see the Chinese character “Po” formed by brushes on your left. Walk up a little bit further, you can see this escalator system. Follow the path on the right hand side. You can see a building in traditional Chinese design. This is the lower station of “Po Fook Hill Cable Car”. The station uses “no step” entrance design, allowing access of disabled people and wheelchair users. After entering the building, it is a tiny waiting room. Waiting room is not air-conditioned. Only a large fan is installed to cool down the passengers. If it is too hot, buy some chilled drinks from the vending machine outside. Where is the cable car? It is here! Don't be misunderstand. This is not an elevator. It is a cable car! So this waiting room is actually the cable car “platform”! Cable car is computer controlled but does not operate on its own. In order to take a ride, you should press the button like taking an elevator. This cable car looks just like an elevator from its appearance. And even this notice said it is an “Elevator”.But in fact, it is registered as “Funicular Railway” under Hong Kong Electrical and Mechanical Services Department. So it is 100% “Cable Car”. After the doors opened, you can see the interiors and windows. It is definitely a cable car. The cable car compartment is very small. The seatings are arranged as 3 passengers on each side, facing each others. In between, it can accommodate 4 more standees. It can carry up to 10 passengers in total or 750 kg. The compartment is also not air-conditioned. And even fan is not available. Ventilation is provided by windows on both sides and this tiny window on the top. Lighting is however available. But since Po Fook Hill closes at half past five everyday, this lamp is not much useful. “Po Fook Hill Cable Car” is a product of Gangloff Inc., Switzerland. The main business of this company is producing funicular railway system. Products are distributed and maintained by Schindler Lifts Company in Hong Kong. “Po Fook Hill Cable Car” is believed to be the only Gangloff system in Hong Kong. Cable car will not start on its own. There is a set of buttons on the left. After pressing the destination, the opening and closing of doors should also be controlled by the passengers. The operation is exactly the same as that of an elevator. After closing the doors, the cable car will move forward to the destination automatically. Passengers cannot stop the car in the midway. In case of mechanical failure, passengers can press the bell for assistance. There was still a large gap after closing the doors. This looks unsafe but can increase the ventilation of the compartment. Seats are wooden and uncomfortable. This certificate is hosted inside the cable car compartment. It proves this cable car has passed the routine test of Electrical and Mechanical Services Department. This kind of certificate can be found in all elevator operating in Hong Kong. An incident of passenger being trapped inside the cabin happened in 2005 on “Po Fook Hill Cable Car”. Because of that, a notice of emergency phone number is posted inside the cabin. But no communication devices are available inside the cabin. Passengers need to use their cell phone to call the number for help. Doors of “Po Fook Hill Cable Car” open this way. From the video clip, you can see the doors of “Po Fook Hill Cable Car” are double layer. The operation is exactly the same as that of an elevator. Looking from the outside, cable car is green in colour. There is only one cabin on the entire “Po Fook Hill Cable Car” system. No spare cabins are available. According to Building Ordinance, the track area is defined as “Liftway”. Non engineers are not allowed to enter. Cable car just departed from the lower terminus and moving slowly to the upper terminus. Cable car climbed slowly along the tracks and finally arrived the upper terminus. After all passengers alighted, the cable car started to move along the tracks, back to the lower terminus to pick up other passengers. The speed of going downhill is as slow as going uphill. From this angle, it can be seen clearly that the wheels of “Po Fook Hill Cable Car” are made by plastic. And the tracks of “Po Fook Hill Cable Car” look like this. The stairs alongside is for maintenance purpose. It also acts as an escape path for emergency. Looking out from the cabin, the feeling of going uphill is like this. When the cabin reached the end of the track, it shacked a little bit. Gradient is the same throughout the whole journey. It is about 45 degree, even greater than 22 degree, the maximum gradient of Peak Tram. But since the floor of the cabin is designed as horizontal, it does not seem like that steep if not looking out of the windows. When the cable car climbed up to a certain level, looking out from the hill top is quite scary. The traveling time of the cable car from one end to the other is about 2 minutes. Including the time for boarding and alighting, the maximum headway of “Po Fook Hill Cable Car” is about 5 minutes. Using escalators is normally faster than taking this cable car. And “Po Fook Hill Cable Car” is the lowest capacity railway system in Hong Kong. 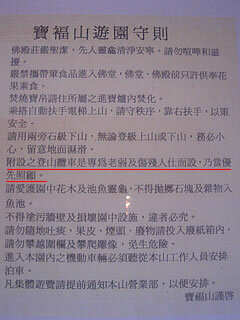 Because of that, a notice can be found inside Po Fook Hill, saying that priority riding should be given to people in need. When the cable car reached the midway, you can see this balance passing underneath the track, going to the other direction. This shows the operation of the cable car is similar to that of an elevator. How about the feeling of going downhill? Since the cable car has climbed to a certain height, it is very scary to look out from the windows. Pay attention to the middle part of the video clip. You can see the moment when the balance passing underneath the cabin, heading to the opposite direction. The upper station is the same as the lower station. This cabin car really looks like an elevator. The design of the upper station is the same as that of the lower station. It also features a no-step design to allow access for disables and wheelchair users. The waiting room is also not air-conditioned. The cabin car was facing a minor problem. The doors of the cabin closed but the doors on the platform were stuck. The cabin could not move and passengers were trapped inside. From this model, you can see the routing of escalator and cable car clearly. Apart from those, Po Fook Hill also provides two staircases for visitors who enjoy hiking. 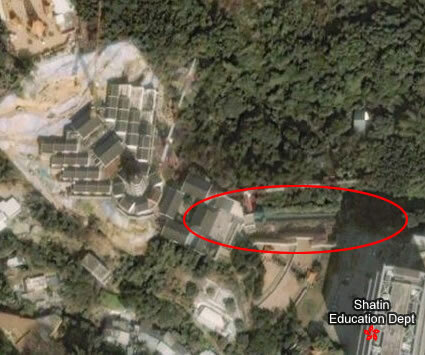 Po Fook Hill is located in Shatin, Hong Kong. It is adjacent to Shatin MTR Station. The walking distance from Shatin station is about 5 to 10 minutes. Apart from taking MTR, there are also a large bus terminus next to Shatin station. Many bus routes provide direct and convenience services to different areas. Also, car park is available in Po Fook Hill for car users. There are soft drink vending machines and washrooms inside Po Fook Hill. Also, a number of shopping malls can be found nearby with lots of restaurants. Po Fook Hill welcomes anyone to visit. No reservation is needed and no entrance fees will be charged. Visitors with no relatives or friends buried inside can also come. So, if visiting cemetery is not a taboo for you, it is absolutely fine to treat it as a place for picnic. But be aware that it can be quite crowded during Ching Ming and Chung Yeung Festivals. “Po Fook Hill Cable Car” is one of the facility inside. Riding is free of charge. Visitors are allowed to ride as many times as they wanted. And the only term is priority riding should be given to people in needed! Taking photos inside Po Fook Hill is not forbidden. But since it is a private premise, I would like to suggest all rail enthusiasts to be concealed when visiting and never cause any inconveniences to other cemetery visitors. Thank you!